Part I: The Prototype Festival rolls on with a big production at Irondale, a Brooklyn venue which offers a large space and unusual opportunities for audience viewing. The Infinite Hotel by Michael Joseph McQuilken is having its world premiere. 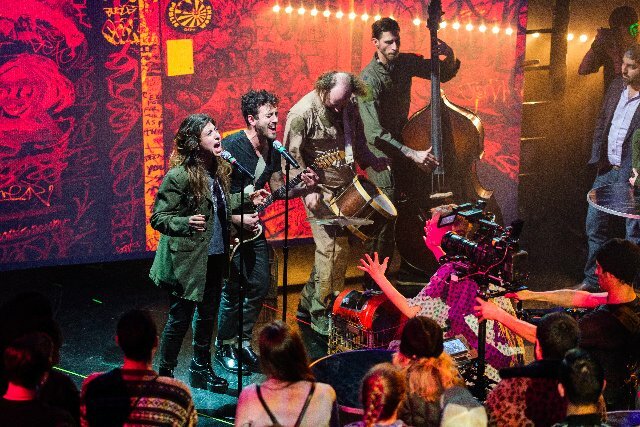 As all performing arts organizations search for new audiences, three elements of live performance are paramount: programming, place and personal experience. The Infinite Hotel is pressing each of these boundaries. The music ranges from conventional classical (Felix Mendelssohn) to cutting edge pop. If you've resisted one form, you can be led into it by another. 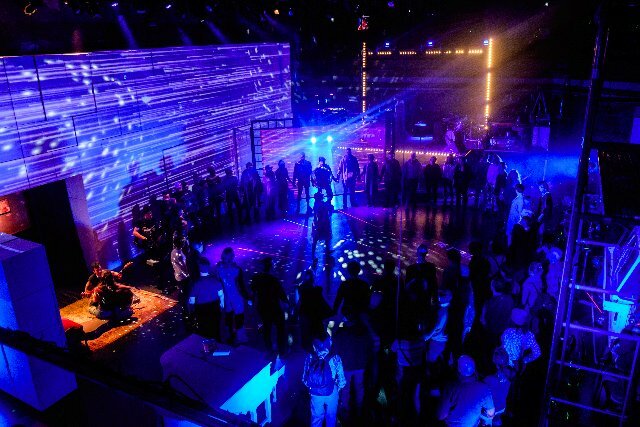 The venue, Irondale, has very high ceilings, like LaMama and the Park Avenue Armory in New York. It can be either wide or deep like the Armory. LaMama is deep only. Both Irondale and LaMama sport balconies around their rims. Audiences can sit there, getting a different view of the proceedings. If we wish, we can sit 'on stage' at Irondale and participate when directed. Nothing could be more personal than becoming an 'actor' among actors. At The Infinite Hotel, we are given headphones through which live music is made inseparable from our hearing system. The creator McQuiklen writes: “The sound mix in the headphones is a live mix of the artists, musicians, and actors who are all wearing hidden microphones. In a few cases we use a prerecorded sound like a subway station ambiance or cell phones ringing...nearly all the music is produced and captured live." 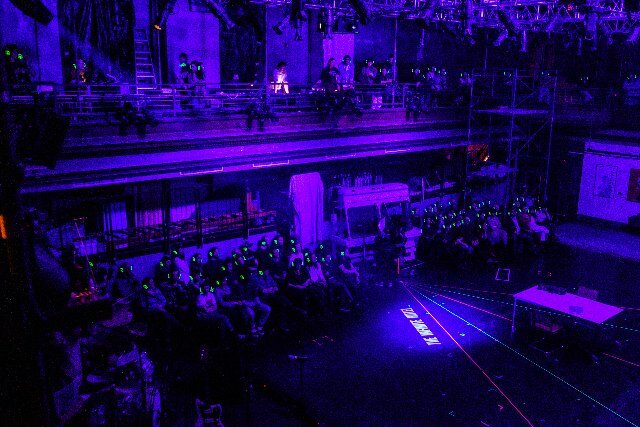 When the headphones are on, their green lights beam out into the performance space like space elves. Five stories are told simultaneously as we share of lives of our neighbors, a rock star, a young pianist who gains fame by being run over by a street sweeper, Kevin. A girl who has been hit by a car and is being tended by an over attentive mother, who meets Kevin in a group trying to overcome the circle of violence. One nook in the stage level space is occupied by a hospital bed. The young girl is in a coma, Her mother awaits any sign that she is coming back to this world. She can’t get the staff’s attention when they’re needed. An actor chooses to hear Mendelssohn on an old record player. A singer struggles to perform. When she does the singing and the song sparkle. The cameraman who is recording this work is on the floor with just one break in two hours. His movements are choreographed and compel. McQuilken explains that each performance is unique and it is recorded to be emailed to everyone who has participated. The notion that a cameraman in a documentary could fade into the background has never appealed. Here he has quite the opposite role, a central character who instantly delivers to the viewer close ups of the artists. Dutch composer Michel van der Aa uses simultaneous camera images and so too the fabulous Rob Roth in his Soundstage. 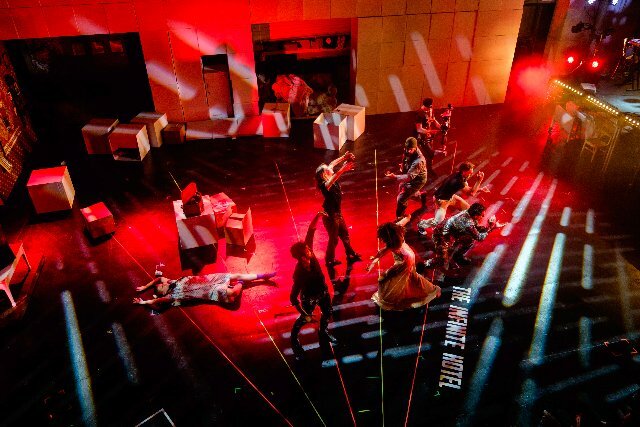 Ivo van Hove in his recent take on Luis Bunel’s The Damned also used intimate projections to bring the actors up close and personal to the audience. McQuilken may not have intended this effect. Yet, sitting in the balcony, which had chairs and stools on three sides of the space, we enjoyed this perspective. Observing the live camera operator in motion makes us feel like we are capturing these moments forever, as evanescent as live art may be. Earlier this year in Lisbon, I attended a music event in a Bread Factory in a western section of the city. Like Irondale, it was a huge space. Instead of sitting, the audience stood, swaying to the music, but not dancing. There were different levels on which the room was dark. Spots occasionally toured the space. Sprays of light welcomed performers. We were banded, as we were at Irondale. The Bread Factory in Lisbon was packed and so is The Infinite Hotel. The idea that there is an infinite amount of space for visitors was a notion of David Hilbert. The German mathematician looked back as far as Euclid to support his calculations. Mary and Joseph should have found a room at the Inn by Hilbert's analysis and certainly as McQuilken sees it. Infinity provides this. McQuilken's music theater embraces pop stars, pianists, performers, and the audience. They add to the joy and the community of this rollicking evening, gesticulating, mingling and dancing to The Infinite Hotel’s beat.